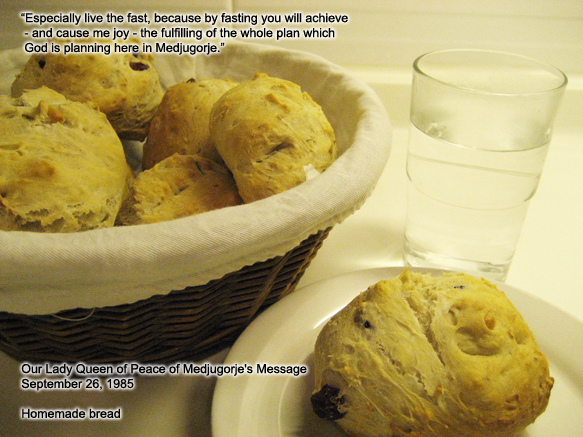 This bread is very hearty and really sustains one who chooses to fast on bread and water. In a medium sized bowl, dissolve yeast in 1/2 cup lukewarm water. Cover with a plate and wait a few minutes until bubbly. In a large bowl, combine the flours. Make a well in the flour and add the yeast mixture. Mix a bit. Reusing the now empty medium bowl, combine Salt, Sugar, Butter, Oil, Raisins, Nuts, 1 beaten egg, and the two cups of very hot water. Pour this over the yeast mixture. Mix/knead the dough, adding flour and or water as needed. Knead the dough until it comes clean from the bowl. Cover with a plate or towel and let it rise ten minutes. (I often skip this step and the bread still tastes fine) Knead it again until it has spring to it. Place in well greased bowl and cover, letting it rise until doubled in size, 45 minutes to 1 hour, depending on room temp. Form into desired shapes. This will make two large or three medium loaves. Place in greased pan. Brush the top with remaining egg (if you did not use it in recipe) and sprinkle with sesame seeds, oats or poppy seeds, if desired. Bake at 375F or 190C for 35 minutes, until done and golden brown.